What is the difference between Premium Finish and Hill Country Finish? 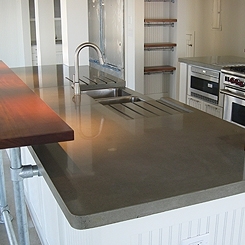 Our Premium Finish concrete countertops are ideal for contemporary, commercial, or high end applications. These countertops are highly refined through the polishing process. They are integrally colored which provides very consistent coloring throughout the entire countertops. Premium countertops have a specialized sealer for high stain and scratch resistance. Our Hill Country Finish concrete countertops are ideal for rustic, Mediterranean, or Tuscan decors. These countertops are honed and have topical coloring which provides more modeling that integral coloring. What is an integral concrete sink? An integral concrete sink is a sink that is poured integrally within the countertop and is one consecutive piece with the countertop. Ideal for bathroom vanities, bar sinks, and outdoor kitchens, these integral sinks are design elements that are hard to find in other mediums. Check out all of our Sink Options. What is the process for concrete countertops? Template for countertops at project site. Cabinets must be in place to template. Bring templates back to our manufacturing facility and build molds off of the templates. Pour concrete countertops at our manufacturing facility. 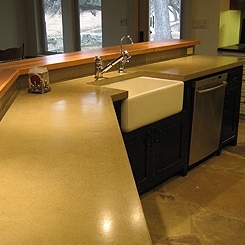 Polish concrete countertop and topically color (if Hill Country Finish). Take the finished product to the project site and install. How do I take care of my concrete countertops? Check out our Care and Maintenance document for instructions on how to be maintain your concrete countertops. What is the cost for concrete countertops? Our concrete countertops start at $100 / sq. ft. (for Hill Country Finish). 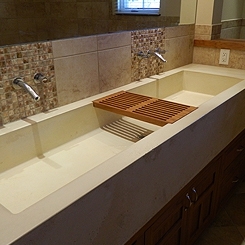 Additional costs are incurred for integral sinks, oversized pieces, and specialized design features.